Join us at our 9th Annual "Taste of Ramadan" Iftaar June 14! The staff and board of CAIR-Chicago would like to invite you to our ninth annual "Taste of Ramadan," which is set to take place this summer at our centrally located downtown office. There is a $10 suggested donation at the door. 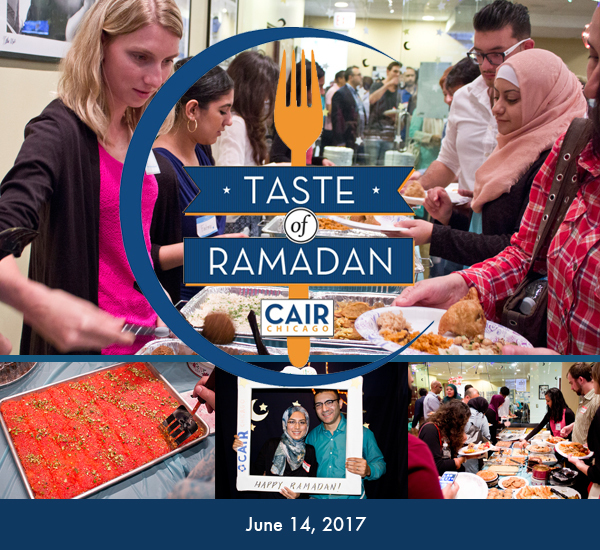 Last year, over 200 community members attended the event and enjoyed food prepared by CAIR-Chicago staff, interns, family and volunteers. Attendees are invited to bring a dish or beverage that represents their heritage or culture. If you would like to contribute to the Taste of Ramadan iftar, please let us know on the RSVP page what you plan to bring and what global cuisine it represents. "Iftar" is an Arabic term that refers to the evening meal that breaks the daylight fast that Muslims observe during Ramadan. The meal is often organized as a community so that Muslims can celebrate the breaking of their fast together. The event will start on Wednesday, June 14th at 8:00pm. Due to building code restrictions, the number of people that can attend is LIMITED. Please make sure to reserve your spot by clicking here to RSVP and confirm your attendance to the event. Here are photos from last year's Taste of Ramadan. All attendees and guests MUST RSVP. In order to meet building codes we cannot cannot accept walk-ins.